Using apt upgrade and apt dist-upgrade is quite confusing since the output usually looks something like this. Is there an option or possibility to make the output better readable? 94 upgraded, 0 newly installed, 0 to remove and 0 not upgraded. From that I have to decide if it is safe to upgrade or not. The packagelist is just plain ugly and confusing. I would like to have a better overview about what will be upgraded. For example, yum (from CentOS) gives a much cleaner view when upgrading. 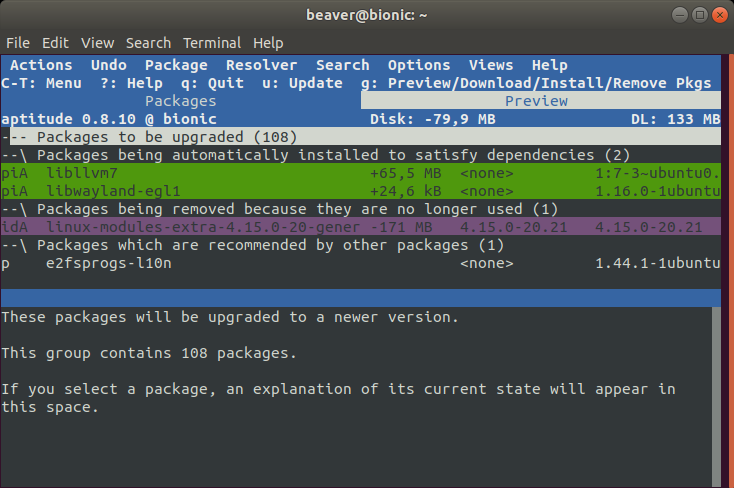 One can easily see which packages will be upgraded, to which version (e.g., if it is a small or major version jump) and also how big the pacakge is to download. Need to get 8002 kB of archives. 108 upgraded, 2 newly installed, 0 to remove and 0 not upgraded. Note: I have collapsed the Packages to be upgraded section for readability of other sections.